Heat a really wide shallow non-stick pan on a medium heat. Chop your bacon into small pieces and fry for 2 to 3 minutes so that the fat starts to render out. While that’s happening, chop up your sausage, brisket and salami into cubes, and add to the pan as you go. Do the same with the onions, carrots, potatoes and herbs. Keep stirring to make sure nothing catches, using your spoon to scrape all the goodness from the bottom of the pan. Turn the heat down if you think it’s cooking too fast. Have a taste to check the seasoning; the salt in the smoked meats will probably be enough, but add a pinch of salt and a good pinch of pepper if you think it needs it. Keep stirring as it cooks and after about 20 minutes, once the potatoes and carrots have softened and everything looks delicious, make your dressing by putting all the dressing ingredients into a jar (reserving the dill flowers if you have them). Pour the dressing into the pan – the acidity will be fantastic with all that rich meat. Carefully separate the egg whites from their yolks and put them to one side. If you want to, leave the yolks in their shells so everyone can tip their own egg yolk into their dish and stir it through. That will give the dish a bit of a theatrical edge. 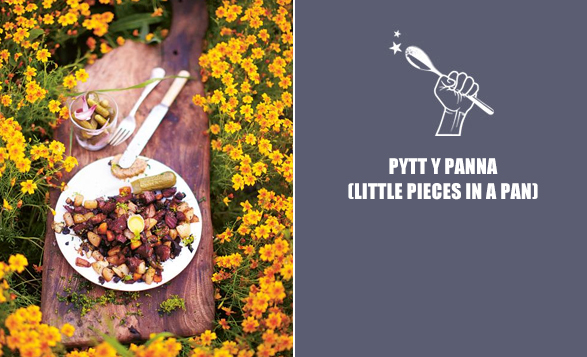 Divide your pytt y panna between the plates. Make a well in the top and add a yolk (or eggshell with a yolk in it) to each one. Load up a side plate with dill pickles, and roughly chop your dill flowers and scatter them over.